Researchers studied 1,544 people age 50-plus. Some of those in their 80s had the lowest inflammation levels in their bodies because they took care of their health. This included cardio exercises along with resistance – weight training with weights and bands, stretching for flexible joints and mobility. Even in extreme old age, centennials showed positive outcomes when they exercised. Low levels of inflammation were also an important predictor of people’s cognitive function, especially those in the oldest age group. I’d have to say that of all the exercises I do, I love anything aerobic (getting my heart rate up) the most. Walking, jogging, biking and dancing are the most common forms to get your motor running and is a great way to shake off the cobwebs. Any quick, sustained movement can increase your heart rate. Before you start moving around, think about what motivates you to push a little harder. Are you interested in exercise to reduce stress and shake off the blues, lose weight, build a healthier brain (cognition), or make new friends? Researchers say those who believed exercise was good for stress reduction valued it more with increased age. Motivation to move when reaching 60-plus can yield different benefits. For instance, people who exercise experience less inflammation in their bodies. Inflammation can lead to illness (stemming from a lower immune system) and difficulty losing weight. Losing weight can be especially troublesome if you have joint issues (hip, knees or back). With each pound you lose, the equivalent of four pounds of pressure can be released. The combination of cardio mixed with bands is one solution for cardio exercise to keep inflammation at bay. It is fun. Be creative and you will never get bored. 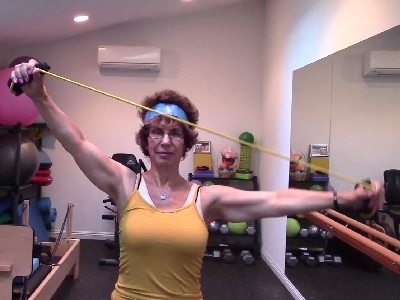 In this month’s Exercise Snack Video, I will show you a few quick examples. Pay close attention to my cues on form and technique and in the long run (pardon the pun), you’ll have fun!! Side note: The familiar tune of the Bee Gees song “Stayin’ Alive” has been used for medical training for some time. It has the right beat — not to mention the perfect title — for providing CPR’s chest compressions at the right pace to revive a patient. Try playing it sometime when you exercise. For more information and tips for you or someone you love related to good heart health, reducing pain from arthritis or injury, decreasing inflammation, improving balance and more, follow us on Facebook, sign up for our “Fitting News” e-newsletter for informative tips on health and exercise at www.lorimichielfitness.com, or simply call us at 818-620-1442 for a consultation.